way to market to your customers with text messages. Upload contacts. Type your text message. Send! Upload your existing lists of opted in mobile numbers. Text message marketing is the best way to reach your customers wherever they are, at any time. Text messaging is a fast, affordable way to bring more customers to your business. 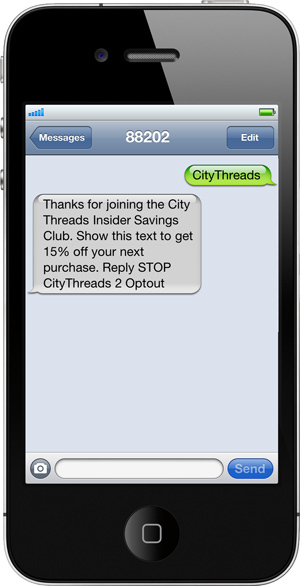 Keywords allow your contacts to text any word you choose to your assigned short code to join your SMS marketing list. Promote your Keyword online and offline. More customers means more revenues for your business. Email messages get lost in a sea of SPAM. Print ads are overlooked. Radio and TV are too expensive for small businesses. Over 94% of all text messages are read. Reach your customers for pennies a person. "TellMyCell made it so easy to notify everyone when our surveyors arrived! It was hugely successful and so easy - well we will just say, 'You Rock'." TellMyCell is a great service. I've been consistently impressed by the quality of the service I've received. In the couple of instances I've contacted customer support, I've received speedy answers and follow-up, even on a Sunday! 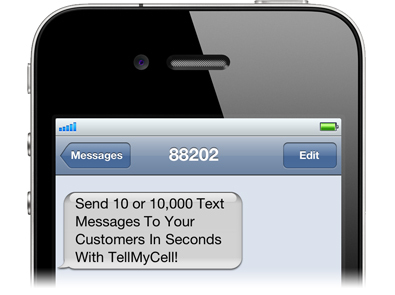 We researched texting programs and TellMyCell provided the most flexibility for the right price. We have increased attendance and participation by utilizing TellMyCell along with our other marketing efforts.